Saks is one of my rocks. When things are going good in my life, I pick up little treats at Saks. When things are going bad in my life, I pick up little treats at Saks. It's my preferred gift card, my preferred 'fantasy' store (I'll admit, I've gone and tried on exquisite dresses to lift my mood.) And above all, I've given in to the chocolates and brownies from Charbonnel et Walker before. On the other hand, Brownie had yet to taste their brownie. Time to put an end to that! Charbonnel et Walker is a British chocolatier, originally formed by Mme Virginie Lévy née Charbonnel and Mrs. Minnie Walker in 1875, and the chocolate manufacturers to Her Majesty the Queen via Royal Warrant. If it's good enough for Queen Elizabeth II, it's good enough for me. 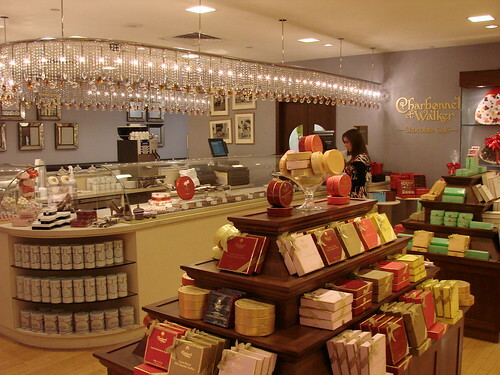 Their Cafe Charbonnel is located on the 8th floor of Saks Fifth Avenue, aka 10022-SHOE. Yes, decadent brownies are 50 feet from Louboutins. This is my version of heaven on earth. The cafe is very upscale Victorian, dusty blues and roses with gold accents and a dripping jewels chandelier above a conveyor belt of pastries. Most of the desserts on their menu are $6 while breakfast pastries are under $5. I've had their brownie a few times. 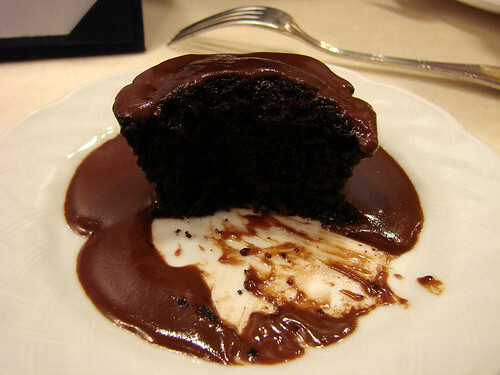 It's moist, chewy, and chocolatey; worth every penny of the $4 it costs. 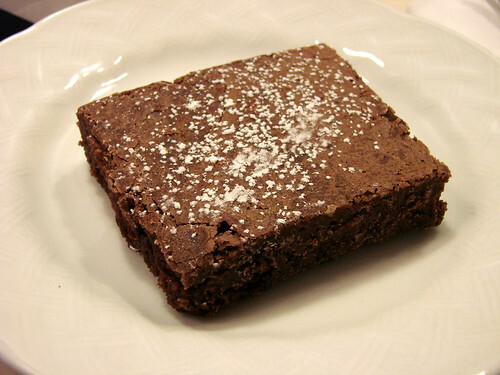 Brownie also thought the brownie was excellent and should be considered one of the best in New York City. When finally accompanying Brownie there, I decided to branch out and try some other dessert options; the sticky toffee cupcake was out, so I went with the chocolate fudge cake and a cup of Charbonnel chocolate. 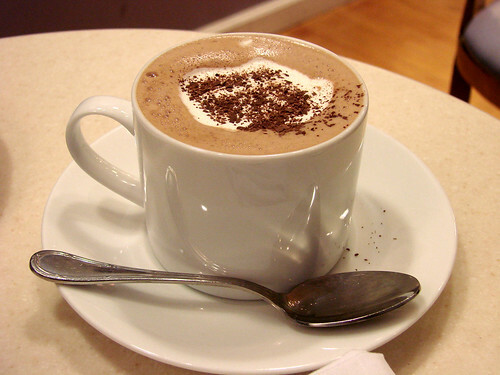 Their hot chocolate is divine, it is the perfect consistency for me, not too thick or too thin, and full of chocolate. It also comes with the choice of marshmallows or whip cream. The chocolate fudge is excellent as well. 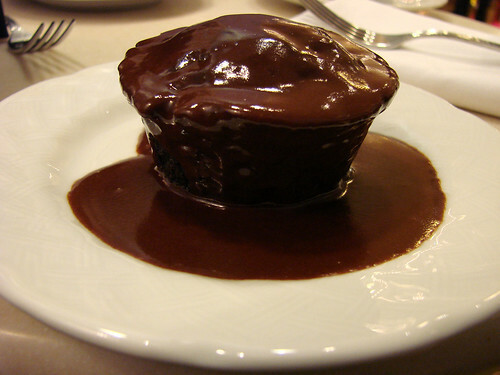 A moist, decadent chocolate cupcake smoothered in a rich chocolate ganache sauce. This is quite possible one of the best chocolate desserts I have had in a long time. Full of chocolate, but not too sweet and a good size so you're left wanting one more bite. Perfection. Thanks for sharing this find. I'll definitely need to check this out! LOVE. This echoes the sentiment that nothing can ever go wrong at Tiffany...but so, so much sweeter! Hi, I'd just like to say I stumbled upon your blog by chance.. but I actually ended up going through every single one of your blogs over a few days. keep up the good eating! I love your BLOG! We're getting ready for a trip to NYC over Easter weekend and I can't wait. I've found several recommendations through your BLOG and am really looking forward to the trip. I just wanted to let you know that I am giving you a BLOG award in the morning. It should be posted at 9am central time. Have a great day! Hello its hard to beat saks they have delicious products specially if it is chocolate involved also some people say that tha chocolate can give you pulmonary disease but i think is a lie .